Ed McKeon reviews Heiner Goebbels, Aesthetics of Absence: Texts on Theatre, ed, Jane Collins with Nicholas Till, trans, David Roesner and Christina M Lagao, Routledge 2015. There are moments that stay: memories of extravagant strangeness; riddle-me realities hiding in plain view; encounters with a sensuous world returning our gaze, lending us an ear, disturbing time’s flow. In a cavernous former palace of German manufacturing, 160 metre depth of light and shade, a seated orchestra is silently and mechanically manoeuvred from the mid-space to ‘stage’ front, their music shifting from a Stravinsky-inflected big-band boogie woogie to chiming chords in a hovering pattern, punctuating time yet left reverberating. The space is resonant. An enchanted stillness settles, illuminated only by a distant motorised zeppelin, moon-faced towards the audience then stretching elliptically in its lateral trajectory. A blue-white pool of light fades in, revealing what our ears could only a short while earlier bleatingly disbelieve, but which our noses know is unmistakeable: a flock of 100 apparently untended sheep in ‘centre stage’. For 20 minutes – or what feels like a moment unbounded – they bathe together in the light, unconcerned, in-themselves yet simultaneously for-us. A choir laments a sonnet on desire, death and immortal love by the nineteenth-century Dutch poet Willem Kloos, the orchestra’s harmonies sound alarm, and as a climax is reached, as if on cue, the sheep follow the course of the zeppelin as it serenely glides into the far-distant and unseeable back stage. Meanwhile, a set of the 1911 Solvay Conference (on radiation and the quanta) is rapidly assembled forestage for the final monologue of Marie Curie, combining moments of her Nobel Prize-winning speech and diary entries in the wake of her husband’s death. 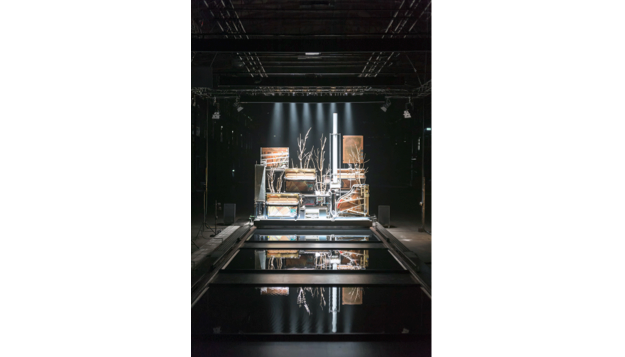 So ends Heiner Goebbels’ production of Louis Andriessen’s symphonic opera De Materie, a manifest exploration of the relationships between material and spirit; substance and subject; nature and culture; and between text, music, light, and scenography. Goebbels stages a reading-as-listening, and a musicalisation of spectacle.1 Strategically avoiding conventional taxonomies of production, consumption, authorship and their hierarchies, his writing – like his work – recasts the relationships between periphery and foreground, the edge-of-frame and focus. It presents a movement in-between, a twilit zone, in media res. This movement confounds those whose value of the arts is predicated on the divisions of labour; or, quoting Hans Eisler: ‘anyone who only understands music, doesn’t understand that either’.2 Musicians mistake him for a director; theatre-makers underappreciate his compositional discipline; like most scenography, the visual qualities of his work go unremarked; and audiences who prefer to be shepherded in what to think or feel are likely to find themselves lost. As such, he is sometimes taken for a minor figure, whereas his achievements as musician and composer and radio artist and theatre-maker and educator and artistic director suggest he may be a modal figure in a minored discourse.3 Aesthetics of Absence, the first collection of his writings translated into English, makes a significant contribution to shifting the margins and the centre of the discourse on practice. The book’s subtitle, ‘Texts on Theatre’, implies a focus on stage-work, yet Goebbels addresses the practices of performance more broadly as a becoming-musical. So while the title Aesthetics of Absence invokes post-structural critiques of the aesthetics of presence as the production of the audience’s gaze – the ‘I’ of the beholder – Goebbels supplements this with a plastic, temporal practice of the ear.4 This collection of short essays and speeches may draw primarily on his own work, that of others he admires (Godard, Robert Wilson, Rimini Protokoll, Erich Wonder, Ensemble Modern), and on pedagogy, but it is as much a manifesto on the possibilities for contemporary performance as it is an introduction to this composer. Rather than repeat, in editorial fashion, the summaries of his writing that introduce the book, for this review I follow Goebbels’s underlying and compelling arguments of how musical thinking and practices can operate within and across a variety of media and performance to create a space for the Other within the audience’s work of self-production. How might we listen into this absence becoming present, this presence made absent? Returning to the fold, what do the sheep in this staging of De Materie care for us? Are they listening to us listening to and watching them? Rilke’s beasts unburden their gaze on us, leaving us unsettled, nomadic. The sheep in De Materie likewise regard us, the hearing-herd, in our serene ignorance. They are uncorralled, unconcerned at our woolly thinking and knit brows. Goebbels does not domesticate the Other or present us with a fabled animal with which to identify.6 This un-called flock appears indifferent to our power to name it (or to count it for wont of sleep): it is neither a presentiment of our dinner, nor of our death. This re-wilding (beyond the Brechtian verfremdung) of the performance space is significant. 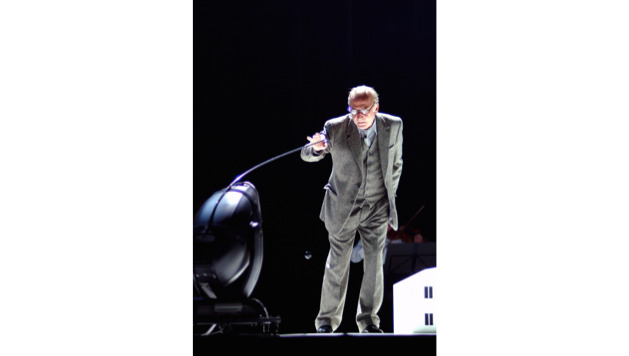 In a similar way, he recounts a poker game of pitching concepts for a work based on texts by Elias Canetti – which became Eraritjaritjaka – to the artistic director of the Théâtre Vidy de Lausanne. After failing to register interest with his first ideas, making a piece to enframe another production or action, he proposed to cast an animal, ‘another non-manufactured dynamic thing with a reality of its own, to which the texts could react’. He proposed a heron, though this proved too difficult: ‘unpredictable, too expensive and problematic for an international tour because of baffling heron-entry-regulations’.8 An eagle owl too proved unsatisfactory; he settled on a ‘robotic’ creature, comprising two lights, remotely controlled, on wheels. His attention to the phenomenologies of different media and their combinations is acute. Throughout these unfoldings of his work, he articulates the multiple contrapuntal strategies he has adopted to suspend and subvert the hierarchies of perception by which performances usually produce their audiences: from making an actor appear to disappear and abandoning conventional expressivity, to introducing obstacles and points of resistance for performers. Yet crucial here are the transitional moments of uncanny synchrony, the different media dancing together before shifting apart, an effect he analyses in Jean-Luc Godard’s Nouvelle Vague. Goebbels composes with intensities, playing with media to disrupt habitual practices of identification to allow time to stick to experiences, enabling the listening imagination to move freely. This plasticity of time echoes Catherine Malabou’s immanent account of voir venir, the move ‘to see (what is) coming’, whereby habit becomes habituated, unaccustomed to itself – becomes the spanner it seeks to remove from its own mechanism – and that attunes intuition to the ‘excess of the future over the future’.12 It registers the possibility for a becoming-otherwise. Where Malabou registers this prophetic vision as a mode of seeing without seeing, a practice of reading, Goebbels supplements this with a déjà entendu, an attunement to the as-yet unheard: a virtual listening. This reading-as-listening invokes Eisler’s remark that ‘music without words acquired its great importance and its full development only under capitalism’, and Walter Benjamin’s corollary, ‘that the task of transforming concert music requires help from the word’.13 Goebbels stages ideas as well as experiences, but he chooses his texts carefully – these are always borrowed, and tend to be short, non-literary, ‘objective’ and non-dramatic, avoiding attachment to the speaker, and range from Mehboob Khan to Giordano Bruno, T S Eliot to Søren Kierkegaard, his former collaborator Heiner Müller to Malcolm X. He finds the musicality in words spoken, rarely sung, often incorporating texts in a Babel of their original languages. These regularly include German, English and French, but have also taken in Mandingo, Arabic, and titles from Japanese and Aranda. Beyond signification, ‘one can “rest in [language] untroubled”’ as Goebbels quotes Stein.14 This dancing to the rhythm of strange tongues perhaps explains the predominance in his work of French writers (Claude Lévi-Strauss, Henri Michaux, Maurice Blanchot, Francis Ponge, Nicolas Poussin, Robbe-Grillet), of Francophile Anglophones (Auster, Samuel Beckett, Stein), and his decision to use Canetti’s texts entirely in French for Eraritjaritjaka (2004). Goebbels describes his method of working with ‘placeholder texts’ (which can later be absented), around which rhythms, visual ideas, music and lighting coalesce, ‘following a poetic logic’. He often works with trusted colleagues, like the scenographer and lighting designer Klaus Grünberg, the actor Andre Wilms, and the musicians of Ensemble Modern, improvising with all the media of theatre from the beginning ‘until a text is found which develops its own strength in the right amount of distance to the scene without degrading the latter by illustrating it’.15 He does not ‘set’ text, so much as listen through it and compose with it, sonifying its syntax, punctuation, and even its typography. It is precisely this ear for the text that lies in wait for the quarry pursued by the imagination, as Walter Benjamin invokes in his metaphor – borrowed by Goebbels – of the text as ‘a forest in which the reader is the hunter’.16 It appears in the arboreal texts of Heiner Müller, Ponge and Joseph Conrad he explores in Ou bien le débarquement désastreux (1993); and in the roaming projection of Paolo Uccello’s The Hunt in the Forest (1470) that features in the scenography for Stifters Dinge, itself based around the enchantment in Adalbert Stifter’s sure-footed description of encountering the splendour of a forest under snow and ice. He composes as a listener, staging the political as a listening awry: not as Brecht would have it, thinking inside others’ heads.20 Like flocking sheep, he determines no dominant hierarchy of media or perception, but allows the movement of one to stir the others without leading per se. This rejection of the omnipotence of the artist and a counter-emphasis on the immanence of the composer to the process of production is a constant throughout his writings and his work. 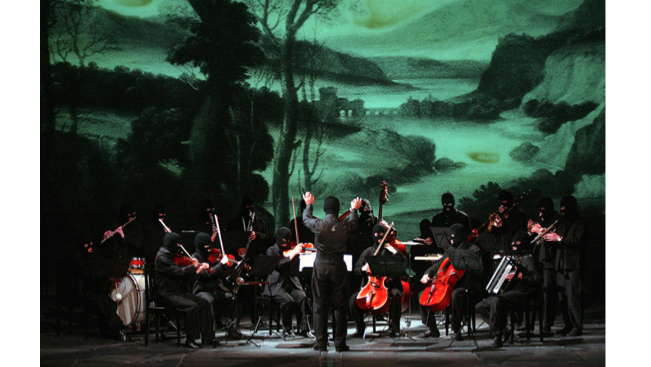 It underscores the porous boundaries between his work and that of others, whether directing another artist’s work (as with Andriessen’s De Materie), incorporating others’ texts or music in his own (from J S Bach and Dimitri Shostakovich to the Beach Boys and Prince), or in the group improvisation of the teams he assembles for his staged pieces. He celebrates the organisation of Ensemble Modern, his long-time collaborators, in their practices of self-administration off-stage that reflect on-stage in their collective responsibility and openness to the new (in contrast to the ‘hierarchical and alienated conditions of [orchestral] hired musicians’).22 Perhaps most radically, he presents the act of composition as the creation of a method of production adequate to the people with whom he collaborates. In order to experience the not-yet-known, the artist must play a role immanent to the culture within which that experience will be produced. What makes Goebbels’ work a pleasure to read as well as to experience is the opportunity to listen between the lines, to hear the wood for the trees, and to listen with the flock without instruction from the shepherd’s whistle. Ed McKeon is an AHRC-funded researcher at Birmingham City University exploring live music production as a curatorial praxis. As director of Third Ear, he produces and commissions experimental music bordering other artistic disciplines, and presented the UK premiere of Heiner Goebbels’ Walden with Ensemble Klang as part of the UK Cultural Olympiad. He is Artistic Director of the British Composer Awards; and leads Masters programmes at Goldsmiths and at Birmingham Conservatoire.